NEW RESEARCH from the top professor of spine bio-mechanics at the University of Waterloo PROVES how stopping this one outdated dangerous exercise holds the key to helping you sculpt the deep, chiseled washboard abs you deserve while spending less time working out. so grab a pen and pad to take notes now. A seemingly endless supply of options, methods, and ideas on how best to achieve perfectly chiseled abs. Today, all your confusion will vanish. 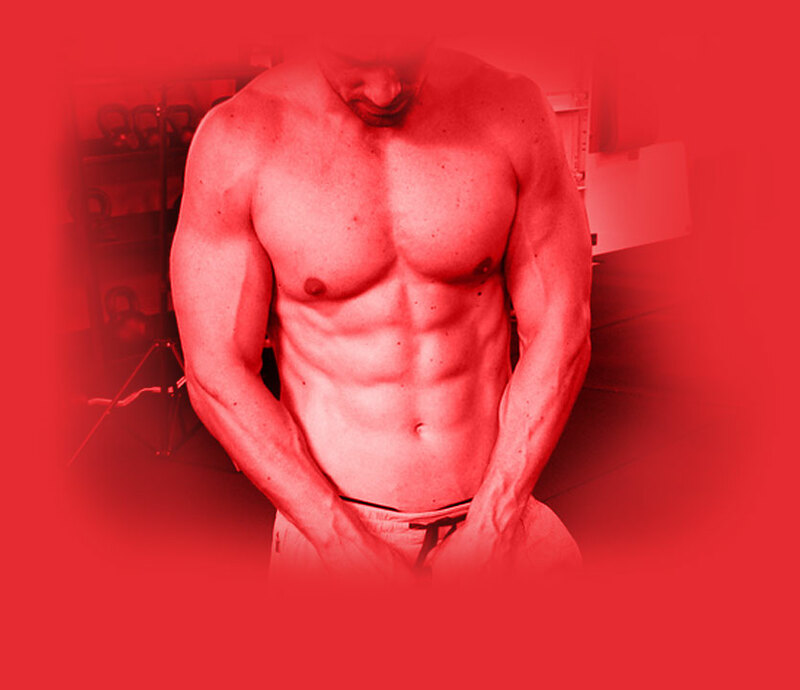 I'm about to reveal an approach that's unique, surprisingly simple, and works for anyone at any age and any stage of their journey to rock-hard abs. Keep in mind I would normally charge for this information, as it will help you achieve your goal of developing a six-pack faster and with greater ease. There’s a rather embarrassing story I need to share before we dive into this new workout method for your abs today. You'll understand why this almost got edited from this letter in a few minutes, so brace yourself and keep reading. You'll see why my embarrassing little episode is so important to YOUR WORKOUT success in just a few minutes... deal? Inside this eye-opening special report is the SECRET KEY to helping you get a flat, defined belly--and why complicated and boring diets are NOT the best way to a flat, washboard stomach (and what you need to focus on instead to guarantee success). Today, I'm a Certified Strength Coach and owner of a Strength and Conditioning business in Florida. I have a Masters in Exercise Science with a Concentration of Strength and Conditioning. Certified in Functional Movement and I'm a Certified Strength & Conditioning Specialist. I know how important it is to sift through fact and fiction to uncover the truth about human performance. You know, a lot of folks think my biggest breakthroughs come about because of the athletes I've trained. “... and stars of football, hockey, collegiate lacrosse, soccer and swimming” and so you'd expect these guys to get great results. Yet the truth will surprise you! normal guy I coached, named Mac. I remember when I first met Mac back in July 2012. I recall it was a hot summer and it was all you could do to wear shorts and a T-shirt to keep cool. It was HOT! I was just finishing up training one of my athlete clients in my studio gym and in walks this older guy in running shorts. He was slim and he was clearly athletic... but right away I could tell he had a problem with his knee as he was nursing a limp. It looked bad and alarm bells started ringing in my head about whether he was already past the point of no return. Now Mac, it turns out, was a runner. He was 50 and held a desk job which had him sitting for most of his day. But despite his activity every day he was in pain. He was trying to live with chronic back and knee pain. Now, the story you're about to hear is pretty bad in places. But this was the experience that led Mac from being in pain all the time to a state of being pain free and stronger and fitter than ever. And I think you want that, too. You see when I sat Mac down to talk with him, he was almost in tears. Earlier that day, he'd see his physician who gave him a shocking diagnosis. 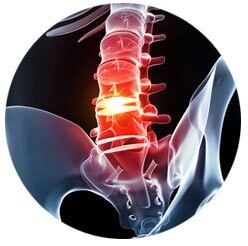 He had a herniated disc which was causing him pain. He had tried to craft a six-pack and build much-needed core strength. Sensible, right? But the more effort he put in, the more crunches he did... the worse the results were. So he spent MORE time doing crunches and MORE reps. And still it didn't show. All the while, his back pain worsened. Then his knee started aching. And that ache turned into a chronic pain. was damaged it was a wake-up call. This is how the doctor explained it. Imagine your spinal discs - the discs which sit on top of each other to form your spine - were jelly doughnuts. These discs are made up of two parts, the nucleus pulposus - or the jelly center - and the outer, protective layer, the annulus fibrosis. Both parts help the disc move. Now, because Mac was doing so many crunches, it was putting direct pressure on the discs at the point of his back where the crunches flex the spine. Through wear and tear, it had caused the outer layer of the doughnut to wear away and the jelly - or nucleus pulposa - was being pushed through. You could see the jelly trying to make an escape. It took this shocking "wake-up call" to push Mac to seek help. Now - having heard of the success I had with the athletes I coach - he was at my door. His goal of trying to get rock solid abs to build a strong core left him unable to workout. He told me it felt like the ground fell from under him. It already ate away at him every time he looked in the mirror and saw how little his effort was paying off. Then when the pain became too much... well, he felt he was being kicked when he was down. "What more could I do?" he asked me, almost in tears. Now, here's the embarrassing part. Until then, I'd only helped pro athletes and coached elites. My approach to training wasn't available to the normal folks who really needed my help. Never again would I allow guys like Mac to suffer unnecessarily, through no fault of their own. I promised myself I’d bring together all my expertise and experience over my years as a strength and conditioning coach to help ordinary girls and guys escape the tyranny of dangerous training advice. On that day, I made a promise to create a program designed for people like Mac and yourself to help you build the strong, athletic body and the iron core you want without sacrificing your health and wellbeing. Today, I'm going to share it with you, and save you the endless hassle and years of effort it took me to hone this blueprint… so keep reading. Keep in mind that, even though I’m a Certified Strength and Conditioning Specialist working with pro-athletes from multiple disciplines, it’s my experience working with and helping folks like you get incredible results faster than you can imagine that really matters. I just happened to figure out a really simple, step-by-step formula designed for the average person to see massive results when it comes to developing their abs in just 60 days. Breathe better, stand taller and enjoy better health and more vitality, every waking hour. Finally develop a stable, strong, armor-plated core to protect your posture and give you explosive power. This is the system I've used to give everyone from pro athletes to everyday athletes the strong core they deserve. So know for a fact that, by using this formula, you’ll be receiving the exact same value as my top elite clients - who I charge $1,000 a day - at a fraction of the cost. I feel compelled to be honest with you, and let you know about the real and serious problem you face right now. And this is why a weak core, no definition and a serious threat of debilitating pain is not your fault. Although, after you read this, you know it now becomes your responsibility to take action. The sad fact is that for years you've been misled by “experts” giving outdated advice on how to build your six-pack. Many of their lies are THE REASON you've been let down in the past. You may have heard, or perhaps even believed at one point, that doing crunches is the ONLY way to get the abs you want. I can’t believe some coaches or online writers are STILL advocating crunches! 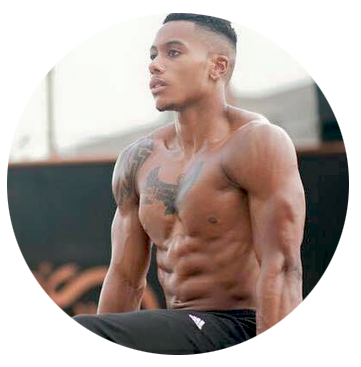 Just know this: countless other smart guys and girls have fallen - and are still falling - victim to the HUGE “crunches” myth, yet you need to lay it aside right now. If you don't, you'll cause serious - possibly irreversible - damage to your spine. You’ll end up with chronic pain in your back, neck and knees. And, you may even end up losing muscle, losing fitness and gaining weight as your body fights against poor posture and being out of alignment. Listen: this isn’t what I want for you. And I know it's not what you want for yourself. The struggle you’ve been experiencing is directly due to this, which is why it's not your fault. However, it's now your responsibility, wouldn’t you agree? The "crunch" has been an exercise staple since the 1940s. The exercise recommended by late night TV commercials, magazines and wannabe fitness gurus at the gym. But REAL fitness experts threw crunches as a serious exercise into the trash can YEARS ago, knowing the dangers and how ineffective they are. Not that it's stopped all the misinformation spread by sports writers, churning out the same old advice from outdated sources. And now anyone with a six-pack and Youtube account can claim to be an "expert" and hand out inaccurate, potentially damaging advice. It’s enough to confuse the smartest person alive… and it confused ME for years. Until I learned the truth from trained professionals. But place a lot of the blame with sleazy “quick fix" online programs who rely on making bold, baseless claims. Stuart McGill, professor of spine biomechanics at the University of Waterloo in Canada has conducted dozens of studies replicating the movement of the spine when doing crunches. This is the reason crunches press on back nerves causing back pain, and can even cause a herniated disc. 1) Crunches causes lower back stress. A 1995 study found sit-ups placed over 3,000N of force on the lower spine, which could cause herniated discs. Imagine willingly applying that force on any other part of your body through exercise? You wouldn't. If you fall for the crunch myth, you will end up in pain, either in your back, neck or elsewhere. 2) Your spine has a shelf life. You only have so many flexions in your spine before it starts to deteriorate. You can’t repair it. You can’t change it. That’s how it is. The more you flex your spine, the more you age your spine. That’s fact. 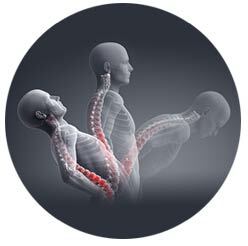 So why would you actively try to flex your spine at its most vulnerable point causing it to age faster and further? Think about it: what is a crunch? You're just replicating the bent over movement you make when you're sat at a desk or slumped in a seat. you're not PROPERLY working your core. You're becoming weaker, less powerful, and more susceptible to problems. You see, crunches aren't functional. They don't replicate ANY natural movement our bodies were designed for. Our bodies thrive on exercises in alignment with their function. Crunching isn't a natural movement. 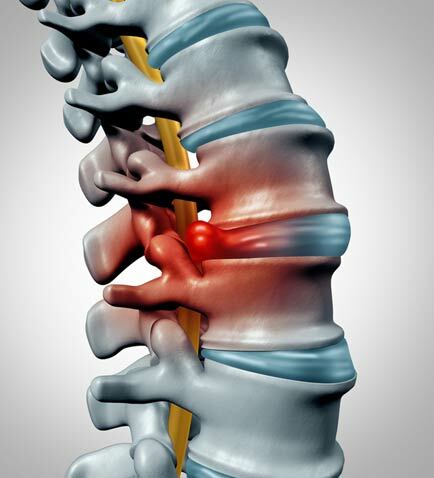 It actively opposes the purpose of the spine and works against it. We are meant to be upright and be able to bend, twist, reach and extend. Yes, you feel the burn. But it's a fake burn - it feels good, but does it actually deliver results? No. Crunches miss your core muscles. The narrow range of exercise does nothing to strengthen your deep abdominal muscles, your transversus abdominis, or your obliques. 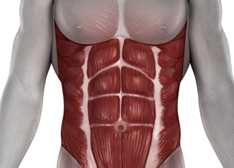 Crunches ONLY work your rectus abdominis close to your skin. So the abs you DO end up with tell a lie. They don’t represent strength. They don’t represent inner power. Your core is no stronger for these "cosmetic" abs. In fact, they put your midsection out of balance and increase the risk of injury. build chiseled abs the right way. Now you're aware of the myths and lies. You can see how they've crippled your ability to gain the six-pack you've wanted for years. It's time to dig in and rise above the lies using these three tips I have for you today. Without these tips, your road to a perfect, powerful six-pack will be a rocky one. Yet using these simple strategies, you'll reach your goal of chiseled abs in no time. And by far the most IMPORTANT tip is showing you how to "reset" your core so you can build your new washboard abs on strong foundations. I'll go into the specifics of my "reset" tip in just a second, so by all means, keep reading. The first thing I have to WARN you is to avoid isolation exercises. Your body is designed to work as a unit. Individual muscles aren’t meant to be worked in isolation. When you work one area without working surrounding muscles, it causes an imbalance. 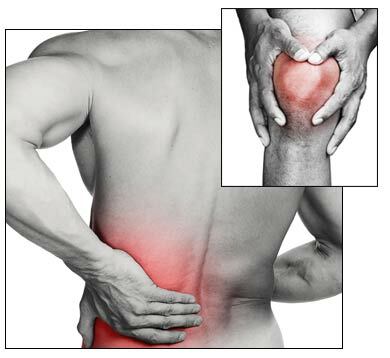 Strong muscles in one area can overpower weak muscles, offering a false sense of security and risking serious injury. Here's the secret: only by fully engaging your core in every plane can you fire up all the muscles in the midsection, front, side, and rear to bring balance to your body. When you do this, you’ll properly work the deep muscles of the core. So here's what you do instead: powerful functional exercises that work your core across three planes of motion. Your core needs to be worked in 3D. By just doing functional rather than isolation movements as part of your workout you’ll see more impressive gains in far, far less time. People will look at you in amazement when you develop rock-hard, chiseled abs without doing a single crunch or wasting hours eeking out marginal gains. With functional movements as part of a complete workout program, everything works in harmony to burn fat, increase energy and build muscle through the core. That's not all: you'll also shave hours and days off the amount of time you need to train your core. Well, listen to this one. want to eat when building chiseled abs? Most people believe you have to haul yourself through the process of complicated and boring diets, but I would rather see you eat foods you enjoy and STICK to a long-term program. 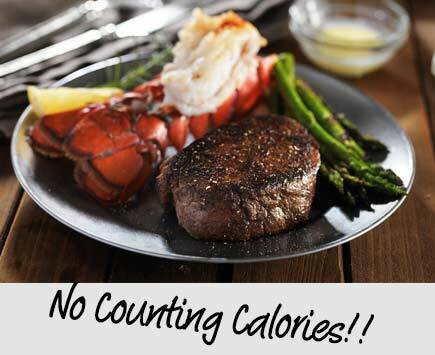 Enjoying your abs diet starts here: simply forget about calorie restriction - this only results in weight loss, NOT fat loss, which is where you want to put your focus. You also need to train your body to use fat as an energy source and taking steps to improve your gut health will flip the switch on improving your rate of fat loss. People will be STUNNED when they see you efficiently sculpting a set of abs your buddies will be jealous of when they're still dieting and missing out! Enjoying the journey is the key to staying on the path, and this simple nutrition strategy will get you there fast! The other tips I just gave you were great, but without applying THIS tip to the rest? Forget about succeeding in your goals. “reset” button on your core strength. It's the tactic behind ALL success in developing a rock-solid six-pack because it allows you to build your core on solid foundations, working every muscle effectively for a balanced midsection that properly supports your body. This is my patented Two Phase Principle, used successfully by virtually every six-pack celebrity or athlete, even if they don't know it! Here's what you do: you break down your eight week plan into two distinct phases of training, each designed for a specific purpose. This is the bedrock foundation of my entire strategy. It's one that will give you a lifetime of power and strength in your core that makes sculpting chiseled abs easier than you could ever imagine. Just imagine what your life will feel like when you MASTER this Two Phase process! your abs. All those frustrations end TODAY. And this is happening in your life simply because you NOW know this formula. It's the little-known success strategy enjoyed by the elite... and now it's your turn! Okay, that was a TON of valuable information. You may be feeling a bit unsure of where and how to get started and that's fine. Choice 1: You can take all the tips and info I just gave you and try to put the puzzle pieces together on your own, without help. You never know! You may eventually put the pieces of the puzzle together on your own, but it will take a lot longer and there's no guarantee you'll make it. Or, there's the smarter choice. The one savvy men and women take to speed up their progress towards owning a washboard stomach. This is the quickest, fastest, and smartest way possible to stunning abs without doing a single, dangerous crunch. Look… there’s no reason to try this on your own - I've already done all the work for you, right? There's no need to scratch your head in frustration, guessing your way to "halfway there", because I've already created the ideal system for you. It's a system I've perfected and tested for years on countless thousands of men and women like you. develop an iron core in just 60 days without screwing up your spine. You have limited time in your day to focus on building rock solid abs... in fact, by doing this functional program you'll get a complete workout. You don't know the first thing about core exercises and they've never been part of your workout. I explain every single exercise in detail with follow-along videos designed to guarantee you hit perfect form right away. You think you're light years away from getting abs. Look... every journey starts with a single step. This program breaks down the journey into simple, digestible chunks. Start now and within 60 days you'll see bigger, more impressive results than you can imagine. You're already injured. The truth is most people come to me already suffering from back pain, neck pain or some other problem caused by poor posture or their body being out of alignment. Through my program, you'll feel strength - real strength - in your core to balance and properly align your body. Crunchless Core is NOT, before I tell you what it IS. 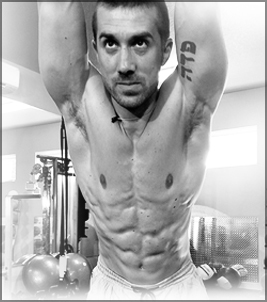 Crunchless Core is NOT a "quick-fix" abs program promising quick results with no effort down. Crunchless Core is NOT a "crunches-replacement" or a hastily thrown together collection of plank alternatives you can find online that simply DON'T work. It is a complete workout system that trains your abs in 3D for the best results. Don't you think you've been fed enough myths about crunches? Isn’t it enough? Isn't it time to start using what's PROVEN to work? Crunchless Core is the direct result of over 15 years of studying and working with athletes one-on-one to discover what works. I uncovered the hidden patterns and unique (sometimes 'odd') tactics they use to stay strong, powerful and injury-free in the world of competitive sport. And now, from this point forward, you’ll have the tools to do just the same. The freedom to work out in LESS time with LESS effort so you can achieve even BIGGER gains. And all of this, while you quickly achieve a rock-solid washboard stomach with abs that pop, faster than ever before possible! Before we go one step further, I need to be 100% honest with you. I hope you're not one of "those" types looking for the next “7 Minute Instant Abs" quick-fix that promises the earth but just leaves your wallet leaner. You get it: more garbage that doesn't work, never has worked, and never WILL work for you. Crunchless Core isn't pie-in-the-sky fantasy land nonsense. And it's only for folks like you who are serious about building an iron core and enjoying eye-popping abs. So, if you're like most folks watching this presentation, and you're 100% ready for REAL to succeed, here's what you're going to receive. Then Crunchless Core isn't just "a"
solution for you… it's the ONLY solution for you. 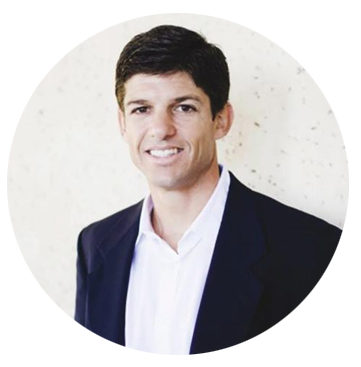 "Brian’s method of core training is unique and unlike anything I’ve seen in my career as an orthopedic surgeon. His training style, combined with his knowledge of functional movement would benefit athletes, workout enthusiasts, and weekend warriors in every gym, clinic, and training center. 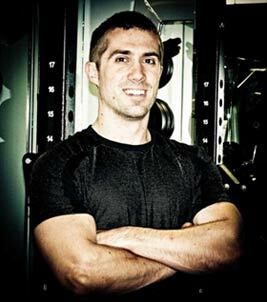 I find Brian’s core workouts beneficial and appropriate for a broad range of patients and athletes. 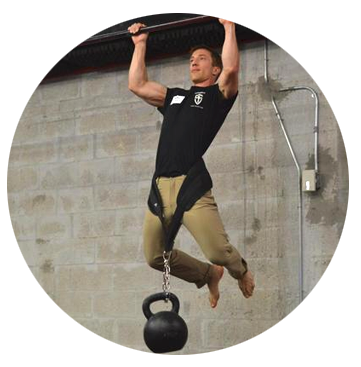 In fact, I would probably perform fewer surgeries if people followed his core strengthening approach." "I have worked as an Athletic Trainer for nearly 20 years, and when it comes to the core, people still today only think of crunching till they have a “6-pack.” The thought that one can focus on one area and “spot reduce” only increases the very dysfunctional thought. But no matter what age, level or ability, none of them could perform without a strong and flexible core as the foundation. If you want to enjoy your highest level of fitness…and do it pain free…get off the crunching floor and experience success through Brian’s program!" "As a male over 40, I've probably tried just about every exercise regime imaginable, so I'm constantly looking for different things to keep my body guessing and my workouts fresh. When I saw that Critical Bench was launching Crunchless Core, I knew I had to try it. 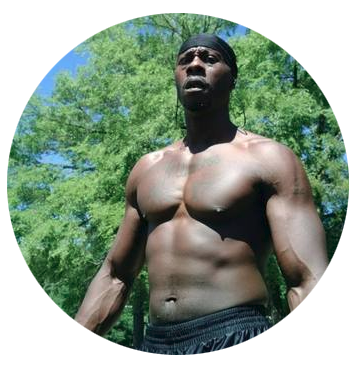 From day one I knew this 8 week program was legitimate from the intensity level it puts you at. Keeping up with the program is easy and works with any schedule. 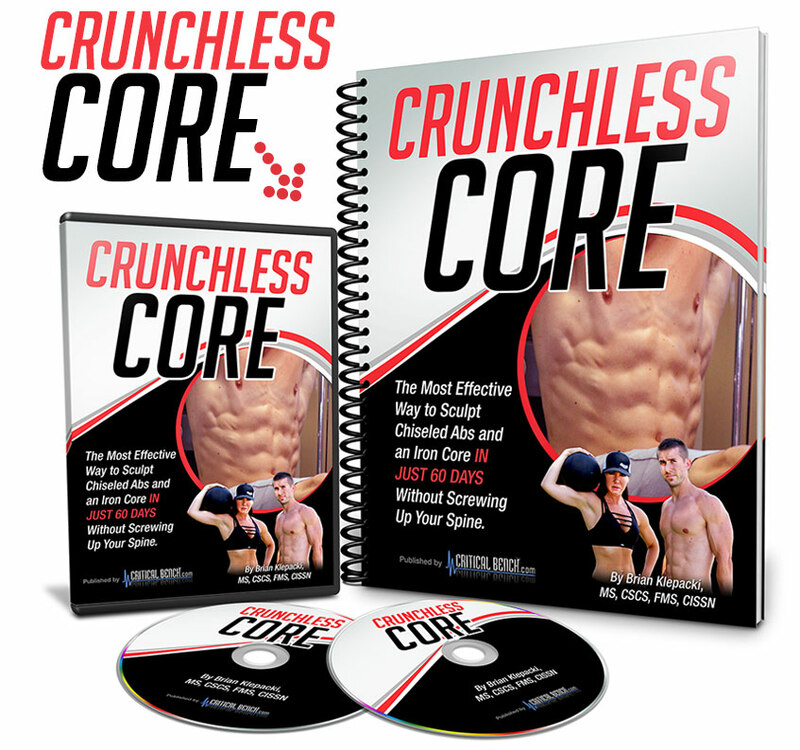 If you truly want results, I highly recommend Crunchless Core!" 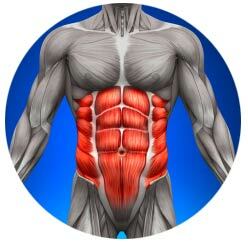 "Current research has shown the downside of performing endless crunches and sit-ups for abdominal development. 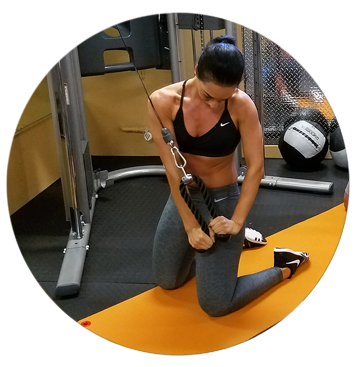 Coach Brian has done a good job creating a program that will work the abdominals in a more comprehensive manner, using exercises that integrate the abs into movement." "I have people all the time ask me, "How do I get abs like you, how do I get shredded?" Well, I finally have an easy way to answer their question; With this program! Laying on the floor doing countless crunches is a thing of the past. If you want to look athletic, then you have to be athletic! 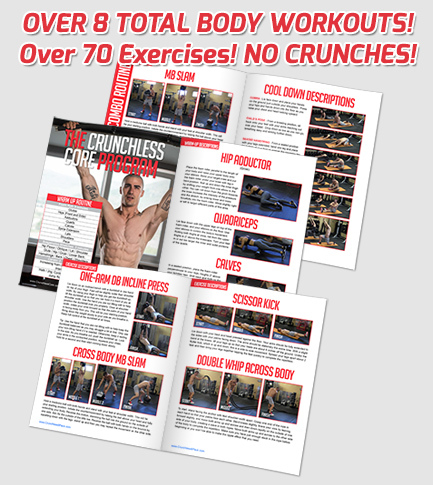 Crunchless Core will lead you down the path to 6-pack gold!" "I spend hours at the gym every week trying to improve my body and much of that time is dedicated to sculpting my abs. Like most people, I do many of the same exercises over and over again with good results but I must say I was super impressed with the variety of movements found in Crunchless Core...many I've never done before. The movements are all carefully designed to fully engage the core and strengthen the entire body without having to do boring crunches and sit ups like you find in most other workout programs. Two thumbs up for me!" 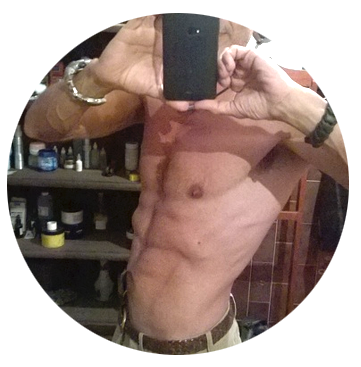 "I'm 50 years old and the CA2.0 program is awesome! My results came from following the program closely along with the consistent diet. In just under 60 days I was able to noticeably tighten up my entire body and get the 6-pack abs I always wanted. I am very happy and will definitely recommend this program to other people!" 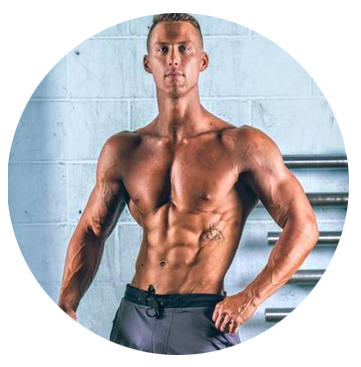 On page four, you'll discover the secret behind my "Two-Phase" Total Body Program. You’ll completely transform your core from the inside-out in just 60 days with the Two Phase Total Body Program. The program includes over eight total body workouts containing over 70 functional exercises… and NOT A CRUNCH IN SIGHT! We’re talking the highest quality content you can imagine as I walk you through the easy-to-follow instructional videos designed to show you PERFECT form. 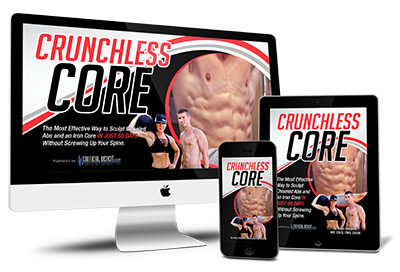 You've no-doubt noticed that Crunchless Core is, without question, the safest, most efficient program giving you a stronger, more powerful core. Which naturally opens up the possibility for you to see a rapid transformation within just eight weeks. And it goes without saying that this program makes your life MUCH easier. Each four-week phase is designed to train your core as a unit - rather than isolating the outer muscles. This way, you’ll burn more calories, add stability through your midsection and look beach-ready by the time the end of the program rolls around… all while spending LESS time and LESS effort training. Which is amazing, considering some of the outdated advice on crunches included spending hours doing hundreds and even thousands of crunches to get the best results. Now, you may be thinking, "I bet any blueprint that can give me all of that would cost a small fortune”. And, in all honesty, It really should. After all, Crunchless Core has already helped hundreds of athletes, professional sports people and guys and girls, like you and me, achieve rock-solid abs faster and easier than ever without pain. I'll get to the price in just a few moments. First, I want to share a few unique benefits this one-of-a-kind system will deliver to you. How about the "bizarre" exercise you can do that instantly relieves the pressure on your spine - nice! Or how to do LESS reps and get TWICE the results in HALF the time! Our normal off-the-shelf retail price for Crunchless Core without any additional bonuses, is $97. 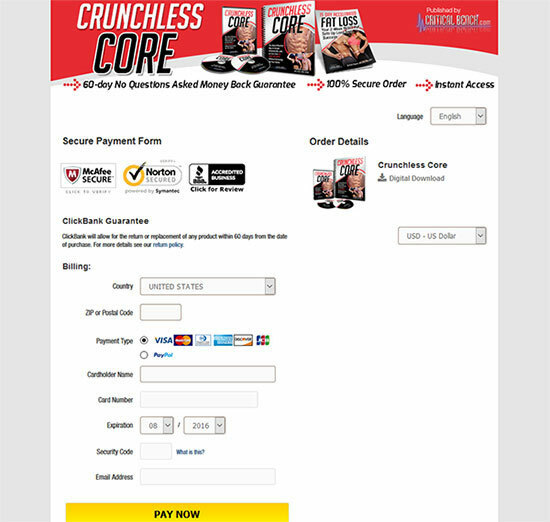 Listen: You're not just getting Crunchless Core when you order today. I have something really special for you. You've shown me how much you desire bulletproof abs. So now I'm tossing in - for a limited time only - one of my best programs as a free fast-action bonus so you can get there even quicker. 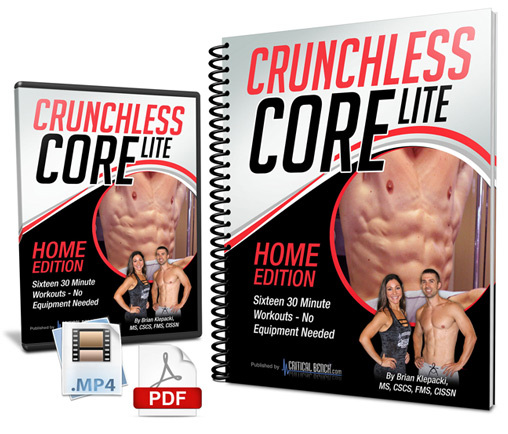 The premium gift you'll receive today is Crunchless Core LITE - Home Edition ($50 Value). I’m sure you realize when it comes to changing how your body looks and feels, there is one “secret” weapon that will get you to your goals faster than ever. It’s being consistent. You don’t need a single piece of equipment to complete any of the workouts - they can be done in your garage, office or a hotel room. Every workout can be completed in less than 30 minutes so you can squeeze a complete core routine into even the busiest schedule. Inside our Crunchless Core LITE bonus program, you’ll discover 16 super-fast core workouts to guarantee you stay on track with your core-building process whenever, wherever. It's normally valued at $50 if you bought this separately... but it's yours FREE today when you take action. 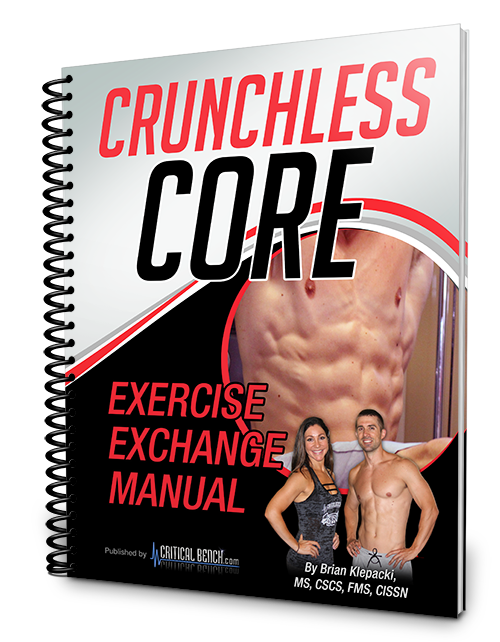 I have one more special BONUS for you and it's called the Crunchless Core Exercise Exchange Manual. If there are any exercises in the program you can't perform due to an injury or if the exercise feels too difficult you can refer to this handy Bonus. It will give you alternative exercises you can swap out for ones you don't want to do or don't have the equipment to do. Don't worry about any exercises you're not comfortable with. You can easily exchange or swap it out for one of the regressions from this booklet. This bonus is valued at $25 but included free with your order today. Now you can see why Crunchless Core is valued at $97. Your premium bonuses ALONE are worth $75, which would bring your investment today for Crunchless Core to $172. However, I have a good reason that I'll share with you shortly for making you a far better deal. Keep reading and I'll share why I'm slashing the price for a limited time. Then there's all the time you'll waste plugging away at squeezing out those hard-to-sculpt abs by still doing what all the freebie programs tell you to do. (Hint: there's a reason they're FREE). And let's not even TALK about all the time you'll miss having the chance to show off your beautifully sculpted six-pack at home, at the gym or on the beach. Neither of us see that as your future, right? Listen: I'm ready to make this a no-brainer decision for you today. I feel you deserve to know why I'm offering you such a massive discount today. Let me share my vision with you: it's a CAUSE I'm inviting you to join today, along with the thousands of others who are ready too. I want to help ordinary guys and girls break free from the dangerous and damaging advice that lazy, old-school trainers and coaches use to hold us back. fear of losing their “edge". I want to create a level playing field so no-one suffers from the long-lasting effects crunches cause to your posture and spinal health. I simply cannot let "price" get in the way of you achieving YOUR goals, as well as helping me make a positive impact. Only on this page, your total investment in Crunchless Core will NOT be $172 today. Cut that price in half... and you're STILL not close! As ridiculous as it sounds, you won't even pay $49 today! Lock in your super-discounted price, which is extremely limited, by clicking on the yellow BUY NOW order button below. ON ME for a full 60 days. Even if you don't like the clothes I wear in the follow-along video... or my accent... or enthusiasm... no worries! I'll give back your ENTIRE investment. No questions asked and no hassles. I'll refund every penny, because I’m committed to producing results for you, no matter what. Plus, as part of my Double Guarantee, if you use the program and think I’ve wasted your time or haven’t delivered on my promise, we’ll pay for your next program by allowing you to pick one of our other products. Click on the yellow button below to secure your discounted price before someone else claims it. 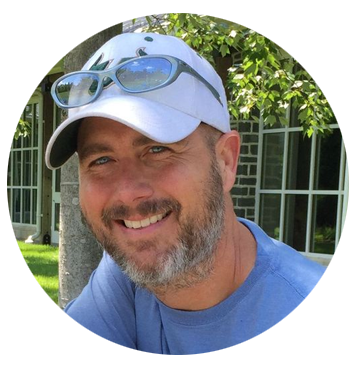 "I can confidently say that Coach Brian invested some serious time and effort to ensure you learn the proper technique and skills in the Crunchless Core program. His knowledge extends beyond helping you to achieve your personal best but extends to work out plans, diet and lifestyle change guidance. I promise you will not find just some random workout routines but some amazing exercises and challenges from beginning to end. This workout is about maximum results and not just a quick fix. I am sending a BIG thank you to Coach Brian for sharing his knowledge and passion for fitness with me." 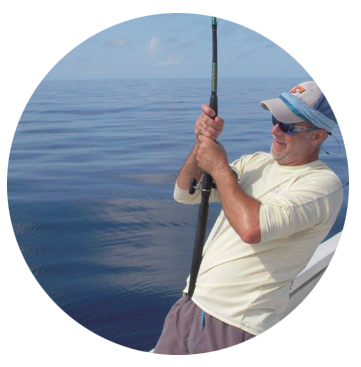 "I am 54 years old and I have had some injuries the past couple of years and I shared my concerns with Brian Klepacki about trying to stay injury free. He made a plan Crunchless Core to focus on stability and balance as well as strengthening my core using total body movements without ever doing a single sit up. His knowledge has opened my eyes to a whole new level of training. I will continue to work with Brian to be in the best shape possible." Works Even If You've Tried Everything Else! "I have been actively training in one way or another for 15 years. Being mother of 3 with limited time, I have trained with personal trainers, been a runner, a Crossfitter, done Orange Theory, Zumba, Boot Camp, tried training on my own and many other classes in between but most programs have fallen short. Brian’s functional training model used in Crunchless Core has improved my physical performance and fitness level all around!" "Being a triathlete and former yoga and kickboxing instructor, I’ve had my fare share of training programs as well as injuries. I've had multiple knee surgeries so running was always painful and slow to say the least. We worked specific muscle groups for biking, running, and swimming, which included a tremendous amount of core and stability training, never once doing ‘traditional’ stomach exercises. The end result was a faster swim without much time in the water, a stronger bike, a much less painful run and I feel great!" "If the desk position is hard on your lower back and could cause long term aches and pains, then why would you lay on the ground and repeatably crank your spine over and over into the desk position?" Yet, just by taking action today, the complete Crunchless Core system, with all the bonuses, PLUS the Super Bonus is yours for only $17. Now, remember, you're not just getting an incredible discount today. You'll be joining all those guys and girls who have chosen to make a better path for themselves and commit to not working harder but SMARTER to get the results they deserve. Plus, you'll join the ever-growing Crunchless Core satisfied customer community. Click on the BUY NOW button right now and lock in your discounted price today. Within a few minutes, you'll have everything at your fingertips: the entire Crunchless Core System, inside the secure members area. Remember: this includes, today only, your premium bonuses, Crunchless Core LITE - Home Edition and the Exercise Exchange, worth $75! Finally, you'll arrive at our secure member's area. It really is that simple to get started RIGHT NOW. Remember: you've been struggling with chiseling out your powerful six-pack abs for way too long. 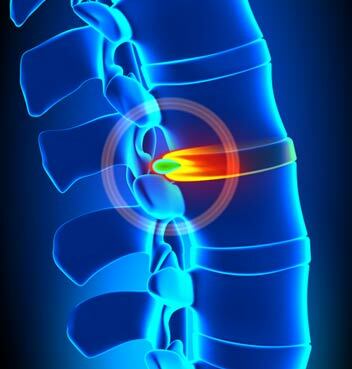 Unless you take action today, you run a grave risk of causing serious - possibly irreversible - damage to your spine and pain in your back and neck. By failing to build your core properly you're leaving your body out of alignment and unbalanced. And, worst of all, your midsection simply won't EVER have that chiseled, Herculean six-pack that comes from training the whole core from inside out. YET: All of this can be avoided, beginning today, simply by applying the step-by-step program I've developed for you in Crunchless Core. See, I have this vision for you. Turning heads as you walk into the room. You are experiencing the body and health you deserve - at long last! Yes, it's true. Your lack of progress and obstacles placed before you - up until today - have been no fault of your own. It's true that you've been lied to in the past about quick-fix solutions. And trainers and coaches have perpetuated the "Crunches Myth" to serve their own interests for far too long. Especially with the 'MORE CRUNCHES IS BETTER" idea so many of us have tried (including me). And who can forget all those false promises other coaching "experts" made to you that never stood up to the light of day? Yet, today is your day to CLAIM your power and take responsibility. You do it by taking action... doing what you know you MUST DO to see REAL results with a program that WORKS! 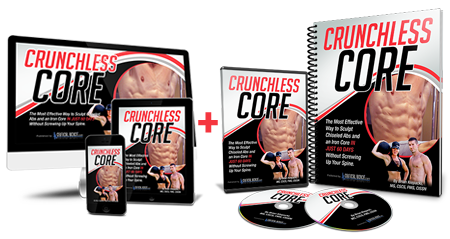 I'm asking you right now to just try Crunchless Core for 60 full days, on me... either you are thrilled with your new set of bulletproof six-pack abs, or you pay NOTHING. Plus, I never leave you hanging - either me or my Support Team will get back to you quickly with any questions you have, so you'll always feel taken care of. Immediately after you buy today, you need to do this: wait for the "Welcome" email to arrive in your inbox with your log-in details and log into the members area. 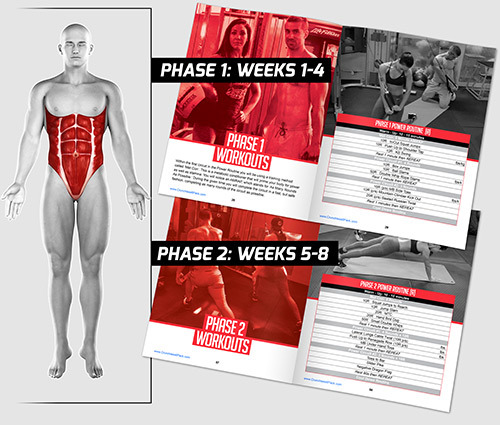 Then head over to the Crunchless Core Workbook and read through the introduction and program breakdown to understand how the Two Phase program is structured. That way you can dive in ASAP and get started seeing results. Diving into the workbook will guarantee you get your program started in the right way to give your 60 day journey to perfect abs a running start. First, keep in mind I've discounted Crunchless Core by over $100, completely risk-free to you with its guarantee. Just know this. I will eventually have to increase the price closer to the retail value, as I'm giving you a massive discount. And, you also don't want to miss out on my one-time-only bonus offer for Crunchless Core LITE - Home Edition and the Exercise Exchange, reserved ONLY for first-come action-takers. Those who act today will lock in their discount and these free gifts. Others won't be so fortunate. And, let's remember: unless you take action now, today, you may NEVER take action. You may do what so many others do and put it off... you know, for "a few more days?"... which turns into months... even years? So, now we both know what you REALLY want and need. And, let's just face facts, and do the only SMART thing left for you to do. Get my one-time, limited discount while it's still available to you, before someone else takes your spot. And get on the fast track to perfect abs using the smartest, safest, most proven system for developing a rock-solid six-pack on the planet. CLICK the BUY NOW button below right now, and let's get you started today. A: What makes this program unique is that it’s a complete workout. Many other programs focus on simply finding alternatives to crunches - like planks and other movements. And that’s all they do. They don’t offer a complete workout system that actually builds from the core with functional movements which don’t cause wear and tear to your joints. Q: Why can’t I just find all this online and do it myself? A: You could try looking for some of this information online or try searching through thousands of articles and studies on core strength and conditioning. Even then you’d still have to go to college and pick up a degree on exercise in order to have access to many of the academic studies and research I used when developing the program. Ultimately, you won’t be able to replicate this program. What I have developed is based on 15 years helping top class athletes and professional sports people and all my experience and expertise has been poured into this targeted, proven program that I know gets results every time. You really won’t find another program like it. Q: How long does the program take? A: The complete program takes 60 days. This is the optimal amount of time it will take to make significant changes in your core strength and stability so you can develop rock-hard, chiseled abs that turn heads every time. The program is split into Two Phases of four weeks each. The first phase deals with building up your core stability and strength. The second phase builds on the first and is where you make the gains which help you towards the six-pack you’ve always wanted. You can, of course, carry on the program as long as you wish. A: It’s really simple. If for ANY reason within 60 days of the program you don’t like anything about it, you can simply contact our customer support team and request a full refund, no questions asked. We’re so confident you’ll love the program, we want this to be a no-brainer for you so we’ve removed ALL the risk. And when we say you can refund for ANY reason, we mean it. In fact, you can try the whole 60 day program and see for yourself the incredible gains you’ll make in such a short time. You really can prove it works without any risk at all. A: This program has been designed for men and women of any age and at any stage of fitness. Whether you’ve never before done a single crunch or if you’re an experienced athlete, you will benefit from building a strong, bulletproof core using the Crunchless Core principles. Every single one of the functional exercises is described in detail and the follow-along video shows you exactly how to complete each exercise with perfect form so you maximize your effort into gaining results. I have done all the hard work of breaking it all down in its simplest parts so you don’t have to worry about a thing. It really couldn’t be simpler to follow. Q: What happens if I’m already injured? Will this work for me? A: Of course! I’ve worked with numerous athletes to support them and help them back to good health and so I’ve designed the program to help you, too. The first phase of the program is specifically designed to “reset” and build your core strength. In the process, you will develop better posture, more power and greater stability in your midsection to support the bigger exercises in the second half of the program. By focusing on working all the deep core muscles rather than just the superficial surface muscles, you’ll bring balance to your body and remove many of the underlying causes behind your injury. Q: How complicated are the exercises? Do I need any gym equipment? A: The exercises have been chosen based on their functionality. While I’ve made every effort to keep the program as simple and straightforward as possible, there will inevitably be some exercises which are a little harder than others to perform BUT for good reason. These work your core more effectively and more efficiently by working through all three planes - remember your core is 3D. No matter what the exercise, you’re completely covered by the program. I outlined in detail every single exercise and walk you through each one in the video to ensure you nail perfect form. You will require either a home gym or a gym in order to complete both phases. That’s simply because there are big movements involved and you need the range of weights a gym gives you. A: Crunchless Core really will work for you, I’m sure of it. Our most successful students of the program followed it through all 60 days and were able to develop beautiful, chiseled abs while remaining injury free. If, in the highly unlikely event, the program doesn’t work for you, don’t worry. We’ll refund you all your money - if you’re still within the 60 days refund period - no questions asked. Plus we’ll even pay for another one of our proven programs so you can work on another aspect of your strength or conditioning. There really is no risk to you at all.